Our new Social Centre is finally here, it is situated off Middleton Park Avenue, next to Middleton Primary School. We are open 6 days a week. Our lunch clubs are Monday, Tuesday, Thursdays and Fridays. Saturdays we serve a full cook breakfast in the morning and sandwiches in the afternoon. We serve serving Bacon Sandwiches on Wednesdays morning. On Mondays we have crafts and in the afternoon we have our Dancersise Class. On Tuesdays we have our baking club, guest speakers, nail painting, hearing aid clinic and Line Dancing in the afternoon. Wednesday are Bacon Butty in the morning and once a month we have Live Entertainment, Tea Dance and our Memory Café. We have Trips once a month on a Wednesday. A weigh in session on a Wednesday morning if you want to keep track of your weight weekly. Have a Walking group weekly meeting at the centre every Wednesday from 11am. New members welcome. Fridays we have tea, toast and games in the morning. Our chair based exercise class in the afternoon. We support people to live independent, fulfilling lives by organising activities and classes to bring people together. We also offer one to one support and advice and visit people in their homes. 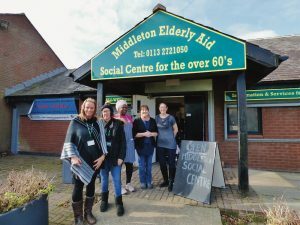 Middleton Elderly Aid are also onFacebook here.